Rovio's vice president of franchise development Ville Heijari's sweeping "every console" statement entails Wii U, 3DS and PlayStation Vita as well as PlayStation 3 and Xbox 360. "We really haven't looked into the Wii U specifically yet - we haven't announced anything for Nintendo consoles yet. But if you look at the control methods, if you look at the Wii U, I mean that's a really, really natural match, so obviously we're very interested in developing there as well," remarked Heijari to Eurogamer. "If you look at the Wii U, I mean that's a really, really natural match." "[The 3DS is] a really really interesting platform," he added. "Many people doomed it outright as it being somehow gimmicky, but obviously the same thing as with the Wii U: if you look at the 3DS, Angry Birds games would make a perfect match there." Heijari explained how consoles present a wonderful opportunity to flesh Angry Birds out far beyond a simple Android/iPhone game. "We're looking at consoles and seeing how we can bring the current gameplay, the basic slingshot offering, into a really compelling and engaging title for the current consoles," he said. "There's a good opportunity there to do a lot in terms of adding a lot of polish to the graphics and still you get high resolution, you get better frame-rates, you can really do physics-intensive stuff. You can still do the same sort of slingshot game and keep it really engaging and interesting and make it fresh again. And then doing different stuff with 3D graphics and looking at building completely different experiences with more storytelling and that kind of thing. "We're looking at all the consoles," he stated. "We haven't announced any particular titles for any console, but we are looking at every console at the moment." Xbox 360 has been resurgent through wildly successful peripheral Kinect. PlayStation 3 has also had success with PlayStation Move. But despite Angry Birds' casual audience similarities to those two peripherals, it's the core console audience Heijari wants to peck at first. "That wouldn't be the core focus," he said of Kinect and Move. "The core focus would be on getting the best experience out there. "The opportunity is there to do so much more. You have all the horsepower. I'd hate to say better experience, but visually more compelling." "If you look at the Kienct sales figures they're completely off the charts, and obviously you can't ignore that, and that will, I'd hazard a guess, make the gameplay experience more engaging. The same with PlayStation Move. But still we're looking at making the best possible game for just the traditional control methods and that core audience there. [We're] definitely not going to ignore Kinect and PlayStation Move either. "The opportunity is there to do so much more," Heijari added. "You have all the horsepower. I'd hate to say better experience, but visually more compelling." Ville Heijari said Rovio's recently acquired animation studio Kombo could be put to work producing the added visual flair. 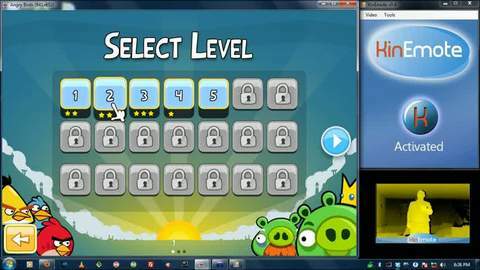 Angry Birds erupted due to a low and, in some cases, non-existent price point on Android and iOS devices. On console, given the added development time, Rovio will aim at a download price akin to something like Trials HD - an example I used that Heijari agreed with. Rovio also has an eye to offering Angry Birds in a box on console. But that would require adding an awful lot of content to justify the price. Of a Vita version of Angry Birds, he said: "Of course - anything new that comes round, especially from people like Sony, is always interesting to us. So Vita is there as well; looking into it, seeing what we can do there." Angry Birds has flown rapidly to 250 million downloads and become one of the most recognisable gaming brands today. Such success has meant Rovio values itself above even the massive $1.3 billion figure that EA will spend acquiring casual gaming giant PopCap.